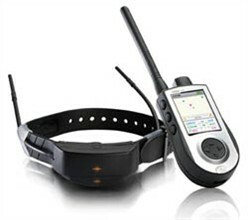 SportDOG Brand’s compact TEK system is the industry’s first combination E-Collar and GPS unit. GPS Collar and E-Collar come as separate, compact modules that fit together on a single collar strap. Train (with stimulation, vibration or tone) while keeping track of your dog from up to 7 miles. You can customize the stimulation up to 99 levels. The handheld device has electronic compass controls and tracks up to 12 collars at once. Whether you need to keep control of a long chase, keep track of where that chase is going, or have the ability to do both, the TEK Series provides tracking and training versatility like you’ve never had before. The battery lasts for a minimum of 20 hours of continuous use and takes only 2 hours to fully charge. The stim range setting allows you to set the stimulation range (low, medium or high) for a temperament of a specific dog. Stimulation type: continuous, momentary (nick), tone, vibration, rising stimulation & user programmable. You can adjust the viewing scale from 100 yards to 75 miles. The update rate (with good battery) is every 2.5 seconds. You can store up to 20 waypoints, save your current location as a waypoint, and navigate to, rename or delete existing waypoints.